Data can be incredibly messy, especially when you're working with a lot of it. Naturally, a program that helps you see and understand your data, should also help you neatly organize it as well, and that's exactly what Tableau does. One of the best examples of complex and tough-to-analyze data is survey results. 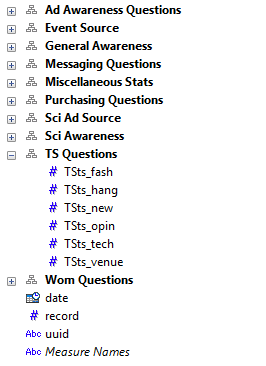 Often, the data comes in a format with related columns that aren't grouped or don't respect that there's an order to the data due to how the questions were asked. With Tableau, you can easily create hierarchies to keep your data neat. Even if you don't actually need the hierarchy aspect built into your data, using one can easily organize your fields into similar categories, which makes it easy to keep track of everything. 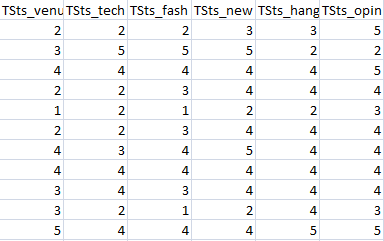 And if need be, it also puts them in a certain order, essential in survey data. Create a hierarchy simply by dragging one field on top of another. Tableau will automatically create the hierarchy. Then, drag and drop the fields within the hierarchy to alter the order if needed. You can also find the example workbook here. I generally prefer a tall data structure over a wide data structure when dealing with survey data. Instead of one row per respondent, I find Tableau enabled to create more interesting analysis with one row per respondent-question combination. Then you can perform a self data blend or self cross join and look at or filter to any possible combination. Also an unpivot would enable you to quickly see that four of your field names in your underlying data are duplicated, but with different response values. Granted this is sample data, but data manipulation errors like this are important to catch. I would really like to organize the measures in a hierarchy as well. While there may be no drill down benefit, it definitely plays to your second point of organizing fields into similar categories. @Joe Mako: Generally I think I'd agree with you about tall vs. wide. As for the duplicated field names, I actually changed the names of a number of fields. Looks like I accidentally gave some the same name. The data source originally had all unique titles. I find it interesting that MS Jet did not notice or error that there were multiple fields with the same name, and just dropped data. I agree with Alex. I would really like to organize measures in a hierarchy as well. This would help add organization to a file that has potentially hundreds of measures.